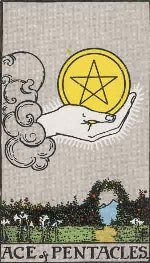 The Seven of Pentacles or the Lord of Failure is yet another card which no subject would ever welcome. It must, however, be realized that every dark night is followed by a bright day. 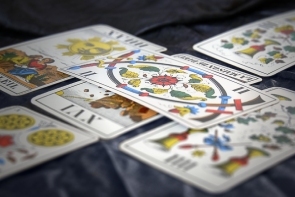 This card indicates something wrong, usually concerning your personal finances, maybe due to an unwise speculation, a failure to obtain an expected profit, or failure to get a promotion or even a gambling problem. This card only reveals your present state of affairs. You may be facing financial crisis or a breakdown in your family or love affairs. There may be a health problem. You think you will not be able to succeed howsoever hard you may try. 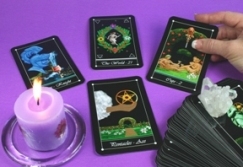 But this card conveys another and more important message as well and that is that failure can be a stepping-stone to success. It is time you assess your attitude towards your life. If you believe that you will fail, you surely will. There is no power that will ensure your success. Remember, you are the architect of your own fate. So put a stop to your negative thinking and make a determined effort for a positive change.